Distinguished participants included: Dr N.D. Desai, Chairman, Apar Group, Mr Hrishikesh Mafatlal, Vice-Chairman and Chief Executive, Arvind Mafatlal Group, Mr Kushal Desai, Managing Director, Apar Industries, Mr Sushant Patnaik, Silicon Valley Entrepreneur and CEO of Investa Ventures, Mr Ron Pitamber, CEO, Heritage Hotels Group, Ms Lisa Kustra, Founder CEO, Plan4Demand, Mr Vidur Bhogilal, CFO, Datamatics Group, Mr Anil Biyani, Managing Director, Damodar Threads Ltd and Mr Bijay Sahoo, HR Head, Reliance Retail, Mr Ashok Nahar, Real Estate Developers, Mr Muru Subramaniam, Entrepreneur and CTO, Global Scholar, R.V. Selvam, CEO, Petroproducts, Singapore, Mr Dinesh Pillai, CEO, Mahindra SSG, Mr Manish Advani, Head, Marketing, Mahindra SSG, Mr Dharmendra Vasant, CEO, GAVS India, Mr Chetan Shah, Executive Director, BNP Paribas, Mr Om Agarwal, Veteran Lions Club Past President and Owner Metal Caps, Mr Prashun Popat, UK, Mr Darshan Bhagat, CEO, China Diamonds, Hong Kong, Mr R.K. Maheshwari, Senior Advocate, High Court, Mr Rishi Sethia, Entrepreneur and Social Reformer, UK, Mr S.R. Pophale, Chairman, Electronica Group, Mr Sachin Agarwal, Director, Alcon Group, Mr Gautam Ashra, Owner, Kanji Forex, Mr Suman Chaki, Sr Banker, Development Bank, Singaore, Mr Sai Sudhakar, CEO, Apar Technologies, Singapore among others. 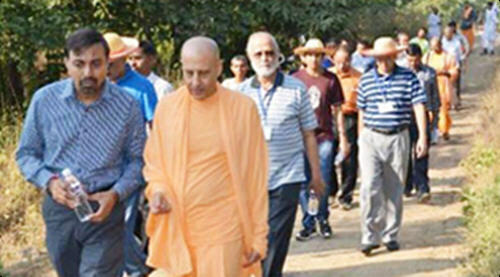 Briefly, the two day event started at the GEV Convention Center, with an invocation prayer by Gaur Gopal das, a senior brahmacari (a practicing monk) and preacher of the community. This was followed by an excellent speech by Mr Hrishikesh Mafatlal, CEO and Vice President of the Arvind Mafatlal Group. Mr Mafatlal spoke very candidly about his own experiences of wealth generation over three decades and the ups and downs he faced in his journey. The audience was deeply impressed by the case study, wherein he discussed about his own family. The Mafatlal family has been one of the most respected families in the corporate world, especially due to the family patriarch Arvind Mafatlal’s compassionate approach when it comes to dealing with employees. It was a great learning experience. 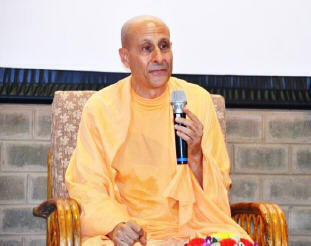 The highlight of the day was the pre-lunch two-hour session with Radhanath Swami based on learning associated with higher responsibility and the role of dharma (spirituality and religion) in our lives. 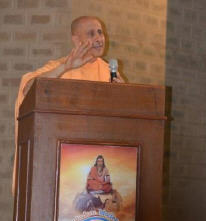 Many participants thronged to Radhanath Swami after his talk, to ask one-to-one questions. Lunch in the banquet hall was also accompanied by animated discussions between delegates in round tables comprising journalists, businessmen and entrepreneurs. 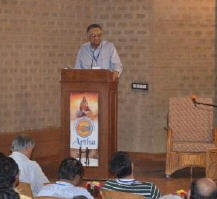 The discussion veered around the presentations in the pre-lunch sessions. Post lunch there was a spirited talk by Dr N.D. Desai, Chairman, Apar Group on the “Science of Giving” essentially based on giving back to society what we have received. It was a beautiful blend of business talk, spirituality with many references to Vedic literature and the Ramayana and Puranas. 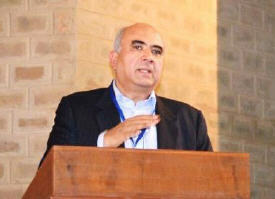 The last session of the day was conducted by H.H. 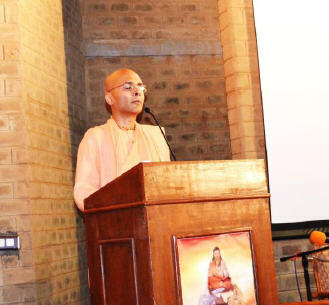 Bhakti Rasamrita Swami, a Senior Spiritual Leader who had been a banker, engineer armed with an MBA. Day One ended with a soulful, spiritual, candle-lit music session in a mystical yogashala (a rustic, Vedic hall used for meditation and yoga). There were hundreds of oil lit lamps mounted on beautifully designed lamp stands adorning an equally attractive and serene altar. 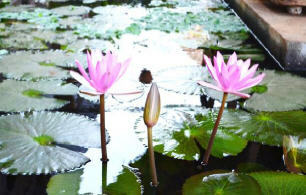 The air was filled with aroma from incense sticks and camphor. 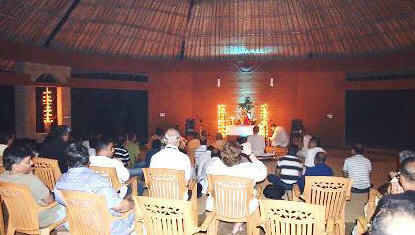 The soft music and singing had a magical effect on the participants. The air was informal and full of reverence. Singers and audience were seated on a clay floor, with the more conservative participants preferring to be seated on chairs. It had been a long day, and this was after dinner. It was an unforgettable experience and a lovely way to end the first day of the event. Delegates retired around 10 pm. 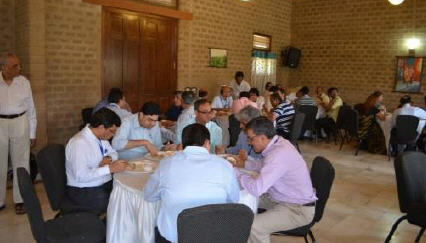 Day Two started with a lavish breakfast buffet with delegates seated on round tables. Hot herbal tea and coffee was served with a variety of South Indian and Continental Cuisine. It was a Sunday, the ambience rustic and the atmosphere was relaxed and unhurried. 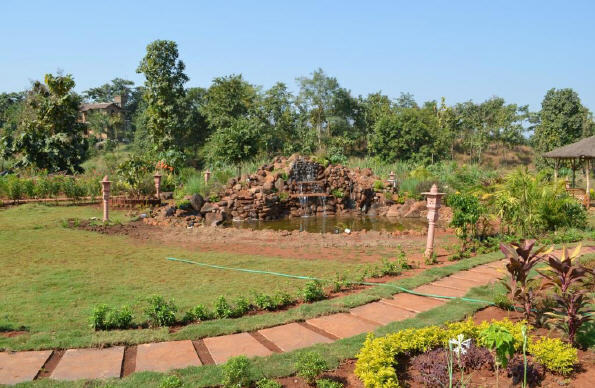 The weather was pleasant and the scenic beauty with hills on the eastern side of the property and an expanse of greenery and walkways made everyone feel rejuvenated. It was time for a Nature Walk. The chief coordinator of the GEV, Gauranga das, an IIT-Graduate in Metallurgical Engineering and a powerful orator and preacher, gave a short extempore speech before the delegates went for the Nature Walk. The first stop was the Ayurvedic Center and Health Spa, followed by a stop at the artificial lake specially built for water conservation, a visit to the brick making unit, the solid waste and water treatment plant, the nursery and the goshala (cow shed).The goshala was housing 68 extremely well kept and happy cows and bulls, many of them well past their productive phase of life. All creatures of God are revered and must be given unconditional love and care, is the underlying theme of this amazing facility. Several delegates clicked pictures and for many it was their first experience mingling with such lovely cows, touching them, caressing them and witnessing their love. 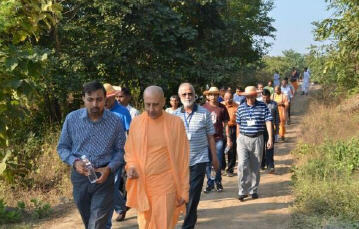 Radhanath Swami went right in the midst of the cows and the calves and lovingly stroked their necks. The calves swarmed around him, each one vying to get his attention and the participants could get a glimpse of his natural love for all kinds of living beings. 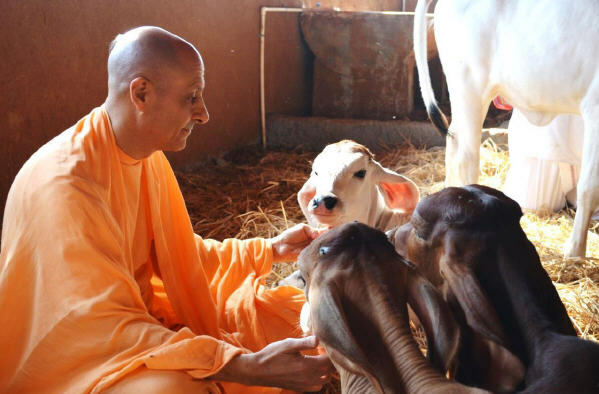 His loving exchange with the calves, showed the universality of love and our inter-connectedness with all living forms and the sacred love for God’s creation. 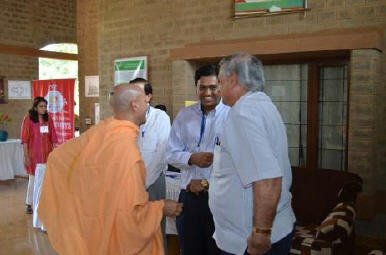 This visit to the goshala left an indelible impression on the minds and hearts of the participants. One could not help think about how far removed we are from the gifts of nature and the bounty Mother Earth showers on all of us. The nature walk ended with a visit to the nursery, the natural fertilizer making facility, the bio-gas plant and the solid waste management place.  Krishna or The Lord does not see what you give; he sees what you hold back.  Spirituality means accepting that there is a high power and controlling us and we need or try to understand the relation with it.  The principal of united humanity is with no discriminations of caste, creed, class, color etc.  We can take care of our minimum needs so we can do maximum for the society.  A lifetime of trust can be destroyed in a single moment of carelessness and irresponsibility.  Charity is not only about giving money but the person about the consciousness, time and the effort puts it in.  The mind is like a monkey. If we give the mind the higher satisfaction then we could let go off the purse of all of our unwanted things, unwanted qualities. What is the banana for our consciousness? Is that inner fulfillment. Krishna tells in Gita, “One who rejoices within, one who is illumine within is a person of true intelligent and what is that within, it’s our understanding our eternal nature, understanding our eternal natural love for Krishna, for God and living in every aspect of our life in that spirit.  If we want to find true peace within we understand God, Bhagavan or Krishna whatever our particular religion is, that one supreme father, mother, the truth is the proprietor of everything and he is our most intimate father, mother and friend. By utilizing our body, our mind, our skills, our intelligence and whatever resources we have to live in harmony, samsiddhir hari toshanam, what pleases God that is where we find true inner peace and that peace is so foundational that we can maintain our values, our integrity, the quality of our happiness in life in the phase of any sunny day and storm day may come before us.  According to the Gita the more accomplish, the higher our position, the more we acquire, the greater our responsibility to live with the foundation of dharma.  Affection motivates people; encouragement motivates people more than money at certain point.  According to Brahmasutra, every living being is seeking pleasure, and that’s the motivating force behind trying to develop power, wealth, influence and all the very essential pleasures that may come with it. It is a search for pleasure. The only pleasure for the heart is the pleasure of Love -“to love and to be loved”. That is the fundamental need for everyone.  The highest recognition is when you are in love with the paramatma – Krishna. Lord. But only those who do not misuse His property are dear to Him.  Lakshmidevi is very finicky; she does not want to only be in your pocket all the time. If you use it in the service of her husband, then the wife is very happy. But if the wife finds out you are only trying to keep her in your pocket like Ravana, then you are in the category of Ravana.  Chanting the holy name of the Lord gives life to our spiritual body, which we have left behind in the spiritual world like leaving something in deep freeze.  Economic activity is the root of the creation of wealth according to Chanakya in the Arthashastra. 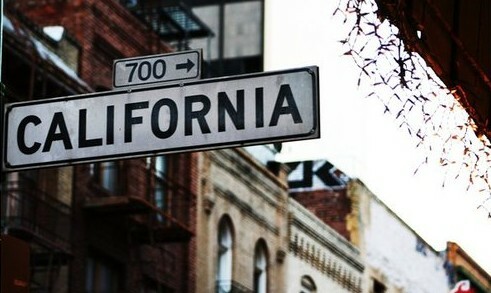 Money is very valuable but it is not honey, the taste of it is not always sweet. It cannot bring you love or happiness.  We have a lopsided development, where the spiritual side is neglected and only the material side, and especially the economic side, is emphasized unduly.  Srila Prabhupada said that everything of this world is perishable and it has no lasting value, so it is like a zero.  Artha or wealth or economic development has some meaningful value and sustainability only and if only it is seen in connection with God.  The Vedic model of artha is that even in the pursuit of wealth one must follow the principles of dharma, one must not be unscrupulous, one must not be greedy even if one is ambitious. And one must learn to abundantly share and give. So producing goes along with sharing, not alone.  While today’s economic wisdom says we should increase the wants of people, Vedic wisdom says that even in the pursuit of wealth consume less.  Ultimately ordinary religiosity, economic development is meant to help us to go beyond even striving for worldly pleasures and coming to the point of striving for spiritual perfection. We wish to express our gratitude to H.G. Gauranga das, Vice-President, Temple Presidential Board and the spiritual inmates of the Govardhan Eco Village for their stupendous help in organizing this conclave. Special thanks to Mr Rajesh Karia, Director, St Laurn’s Group of Hotels, Pune, for giving incredible support for the house-keeping and hospitality by providing a team of housekeepers. Artha Forum sincerely appreciates the help received from Media Services of the Sri Sri Radha Gopinath Temple, ISKCON Chowpatty and the Govinda’s Catering Service for the catering arrangements. Artha Forum wishes to acknowledge the wonderful efforts of Mr Sunil Rathi and Dr Biplab Patnaik in their organizational help and demonstration of the Solid Waste Management.